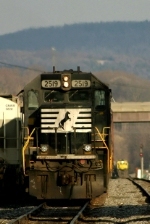 Title: The power for train #W77 pulls the first section of their train up Saluda Grade. Description: A wb NS train climbs out of the small sag at Foristell, MO. at about 60 mph. Description: 19G crosses from track 1 to track 2 at Alburtis, Pa in the late afternoon. Description: On a sultry mid-August day, NS 500 series coal loads move west on track 1 through CP Vine on the Philly Sub behind standard cab SD70. Description: NS 2519 and 9518 leads a manifest in the controlled siding. Description: An NS SD70 uses the junction to turn around and head to the NS yard. Description: The tower appears to still be staffed. Description: An SD70-C40-8 pair have 212 hot on the heels of 204 as they roll under the signal bridge in downtown K-Town. Description: A nice standard cab SD70 brings westbound trailer train 21E through Wyomissing Jct. at 7:38AM. Description: After chasing a CP train north, I caught H67 working Lehihgton. Here he is seen passing beneath the Turnpike at Parryville.